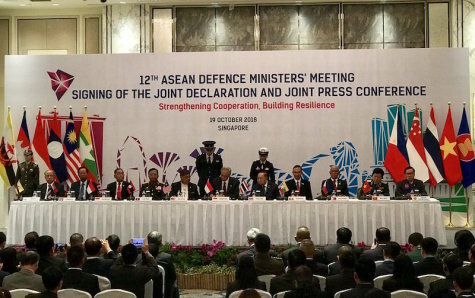 Singapore’s Minister for Defence Dr Ng Eng Hen chaired the 12th ASEAN Defence Ministers’ Meeting (ADMM) in Singapore today, which was attended by all the Defence Ministers from ASEAN Member States. During the meeting, the ASEAN Defence Ministers discussed the security challenges facing the region and pledged to step up cooperation to address these challenges. The Ministers reiterated their strong support for the ADMM’s three focus areas of cooperation this year, namely strengthening regional counter-terrorism cooperation among defence establishments and militaries, addressing chemical, biological, and radiological threats, and establishing practical confidence-building measures on the sea and in the air to reduce miscalculations and de-escalate tensions. The Ministers adopted key initiatives under these three focus areas. This included the “Our Eyes” Initiative to enhance strategic information-sharing on counter-terrorism, as well as a “3Rs” – Resilience, Response, and Recovery concept to enhance understanding of regional counter-terrorism initiatives and identify areas where counter-terrorism cooperation can be further strengthened. The Ministers also welcomed the formation of a new network of ASEAN chemical, biological, and radiological defence experts, to share best practices and make quick contact during crises. Underscoring ASEAN’s centrality in driving regional peace and security, the Ministers adopted the Guidelines on Air Encounters between Military Aircraft. These guidelines – the first of its kind in a multilateral setting – will help ASEAN Member States to manage unexpected encounters between military aircraft, thereby improving safety and reducing the risk of miscalculations. The Ministers signed the 12th ADMM Joint Declaration which underscored the ADMM’s commitment to peace and stability in the region, and the emphasis to strengthen practical cooperation to tackle common security challenges. Thereafter, Dr Ng chaired a Joint Press Conference with his ASEAN colleagues. Prior to the ADMM, Dr Ng hosted the ASEAN Defence Ministers to a breakfast where they discussed recent geopolitical developments and regional security issues. 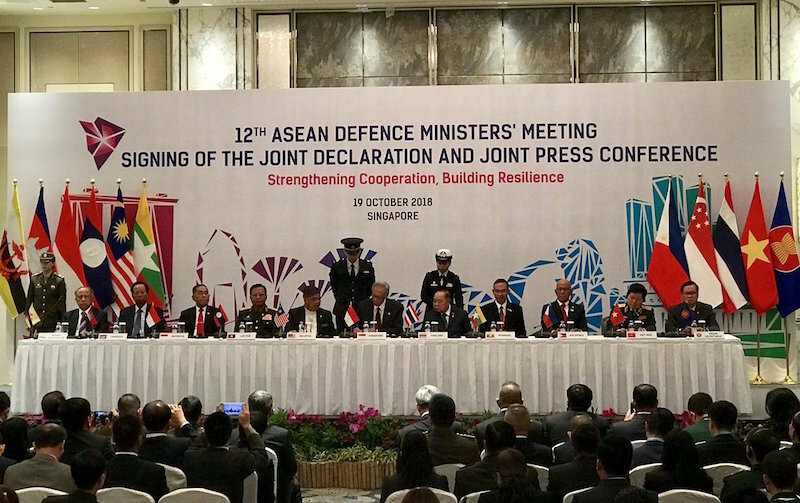 The ADMM is the only Ministerial-level platform for ASEAN’s defence establishments to engage in constructive dialogue and cooperation on regional security issues. Since the ADMM’s establishment in 2006, it has enhanced regional defence cooperation in many areas including crisis communications, humanitarian assistance and disaster relief, peacekeeping, and defence interactions. Click here for the Guidelines for Air Military Encounters, on the Singapore MoD website.